The #1 wine book—now updated! The art of winemaking may be a time-honored tradition dating back thousands of years, but today, wine is trendier and hotter than ever. 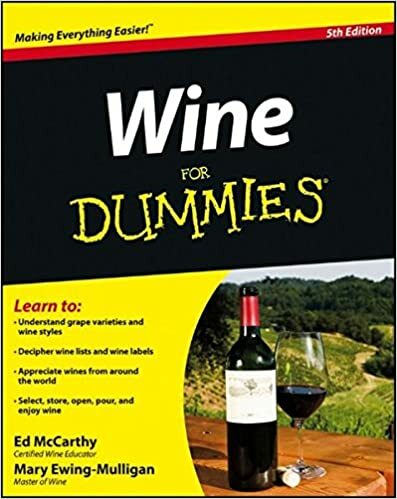 Now, wine experts and authors Ed McCarthy and Mary Ewing-Mulligan have revised their popular Wine For Dummies to deliver an updated, down-to-earth look at what's in, what's out, and what's new in wine. Wine enthusiasts and novices, raise your glasses! The #1 wine book has been updated! If you're a connoisseur, Wine For Dummies will get you up to speed on what's in and help you take your hobby to the next level. If you're new to the world of wine, it will clue you in on what you've been missing and show you how to get started. It begins with the basic types of wine, how wines are made, and more. Then it gets down to specifics, like navigating restaurant wine lists, deciphering wine labels, dislodging stubborn corks, and so much more.